The global polyurea coatings market was valued at US$ 683.0 Mn in 2017 and is anticipated to expand at a CAGR of 10.3% from 2018 to 2026, according to a new report titled ‘Polyurea Coatings Market: Global Industry Analysis, Size, Share, Growth, Trends, and Forecast, 2018–2026,’ published by Transparency Market Research (TMR). The global polyurea coatings market is primarily driven by the high growth of end-user industries. Polyurea coatings are applied in end-user industries such as building & construction and transportation to protect structures from corrosion. 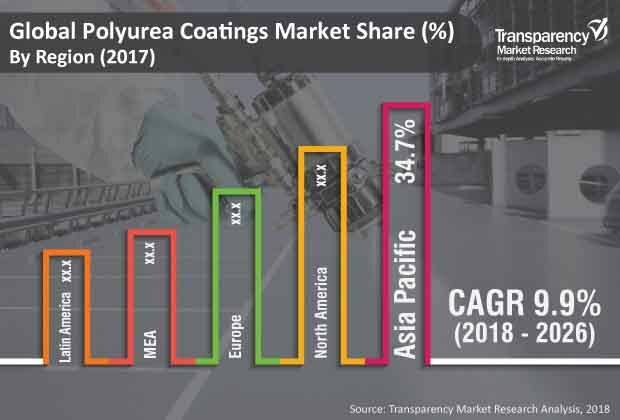 Expansion in end-user industries is boosting the demand for polyurea coatings, owing to their superior performance compared to other coating solutions. The residential construction industry in the U.S. is estimated to expand at a rapid pace, behind that in India, Myanmar, and Vietnam. New York, Houston, Los Angeles, and Chicago are projected to account for 20% share of construction output in the U.S. by 2026. The average price of a house in the U.S. is likely to reach US$ 308,000 by 2030, an increase of 75% from that in 2017. India is estimated to overtake Japan to become the third largest country in the global construction market by 2026. The construction market in India is expected to expand rapidly till 2026. The U.K. is anticipated to become the sixth largest country in the construction market in the world by 2026. It is anticipated to surpass Germany to become the largest construction market in Europe by 2026. The U.K. needs to build 3.3 million houses over the next 15 years to meet the needs of its growing population. Polyurea coatings offer benefits over other coating systems due to their zero volatile organic compounds (VOC) emissions and recyclability. Thus, polyurea coatings are preferred due to their eco-friendly properties. Most coating materials are known to emit VOCs during and after application. VOC emissions can cause respiratory complications in humans. Polyurea coatings provide various benefits such as reduced time and improved safety (due to the absence of organic solvents, low VOCs, and low residual odor/taste). These coatings are also considered green coatings, owing to the zero VOC content vis-à-vis polyurethane and epoxy coatings. Polyurea coatings also do not give any odor when cured. Polyurea spray coatings systems have been developed over the last two decades in the coatings industry. Polyurea coatings are employed extensively in various end-user industries, as they offer superior properties compared to other coatings. However, the cost associated with the application of polyurea coatings is much higher, due to the high price of the spraying equipment. The initial investment in the equipment acts as a barrier for the market. Polyurea coatings consist of five elements: isocyanate component; diluent; polyether amines; chain extenders; and additives, fillers, and pigments. Polyurea coatings are costlier than other coating solutions, owing to the high cost of raw materials. Lack of skilled polyurea coating spray applicators is also expected to restrain the market. However, polyurea coatings prove to be cost-effective while estimating the cost of the entire project, due to their quick processing time. In terms of application, the market has been segmented into building & construction, transportation, industrial, and landscape. Polyurea coatings are widely used in the building & construction industry, as they offer corrosion resistance and can withstand extreme temperature fluctuations. These coatings are extensively employed in applications such as flooring underlayment, ceramic tile laying, carpet laying, roofing, wall panel laying, and wall covering. Based on region, the global polyurea coatings market has been segregated into North America, Europe, Asia Pacific, Middle East & Africa, and Latin America. North America led the global market in 2017. The market in North America is projected to expand due to the presence of leading manufacturers in the region. Expansion in power generation and oil & gas industries is expected to boost the demand for polyurea coatings in North America. Asia Pacific is likely to be a dominant region of the market in the near future, owing to the growth in the shipbuilding industry. The polyurea coatings market in China has expanded rapidly, due to a continuous shift of production facilities of polyurea coatings to the country. Expansion of the power generation sector in emerging economies is also contributing to the demand for polyurea coatings. Demand for polyurea coatings in Latin America and Middle East & Africa is anticipated to rise at a rapid pace during the forecast period. In terms of value, the market in these regions is estimated to expand significantly between 2018 and 2026, owing to the large presence of the oil & gas industry, which is a major consumer of polyurea coatings. High degree of competition exists among players operating in the global polyurea coatings market. The market is dominated by large players and is moderately consolidated. These key players include Albemarle Corporation, Huntsman Corporation, Nukote Coating Systems International, PPG Industries Inc., The Sherwin-Williams Company, Covestra AG, BASF SE, Rhino Linings Corporation, Duraamen Engineered Types Inc., and Zhuhai Feiyang Novel Materials Corporation Limited.